Copy-Paste Coming To WP7 In January? It looks like it won't be long before some of the bigger knocks against WP7 will be no more. WPCentral reports that Microsoft is preparing an update that will include not just copy/paste, but a slew of other improvements as well, including multi-tasking, turn-by-turn directions, and Skydrive/OWA support. That's quite a bit of work done since WP7 went gold, so I'm filing this under "I'll believe it when I see it", while I keep my fingers crossed. But the speed at which this update is apparently coming out, and the more direct mechanism with which Microsoft is delivering updates, makes a compelling case that things have changed for the better from the Windows Mobile days. What is this "more direct mechanism"? Microsoft clearly stated that they will not directly offer upgrades or downloads; people will still be at the mercy of the carriers or , for people like me using SIM free phones, of the OEMs. Last edited by Fritzly; 11-06-2010 at 02:10 AM.. There certainly will be collaboration with OEMs and carriers, but as Andrew says, the updates sit on MS servers that the phones will retreive them from. Given that I already have the option to delete carrier and OEM 'value added' software from the device, I firmly believe that MS is taking hold of this process. They still do deal with partners, so they cannot totally ignore them. 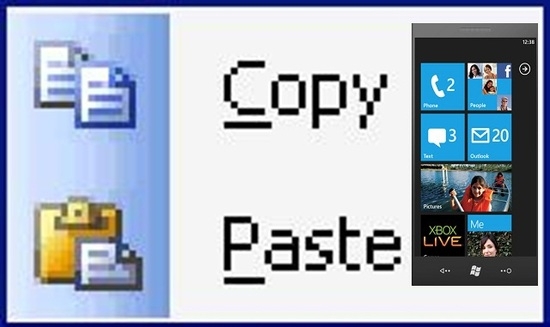 I totally believe that if copy and paste is developed, every WP7 will get it. Same for bug fixes, security issues and any other OS enhancement. If they also add a Tasks database, I'll be looking at this really seriously. I am not so sure; few days ago I read, on this site, a very good review of WP7 made by Anandtech. Personally I lost my faith after WM 5 and 6 so, for now, I will wait, see..... and hope.